As some of you likely know, I am helping to clear out a large collection of salvage and project vehicles from a private owner. You can read more about the collection here in Part I; here in Part II; and the latest update in Part III, readable here. We also have a dedicated post on the trucks in the collection viewable here. I’ve long promised to document the massive stash of motorcycles and parts on the property, and this post will barely scratch the surface as to what’s available – I’ve done my best to identify the interesting bikes and parts, like this Triumph Tiger TR6 motorcycle. I’m sure some of you are better versed than I am in terms of motorcycles and parts, so feel free to make suggestions and corrections in the comments below – but please, be polite. What Makes It Special? “It” in this case is years’ and years’ worth of collecting bikes for repair, to restore, or simply to ride. The owner began his days as a mechanic working on motorcycles belonging to local folks, and as such, took in many bikes for trade or to use as parts bikes. The Triumph actually belonged to the seller as his personal bike and still turns over with ease – I heard it with my own ears. I believe this is the bike model that Steve McQueen made famous, so there’s lots of eyeball appeal even in its current state. Body Condition: Motorcycles are slightly different than your average vintage car as it relates to rot being a significant issue, and most of these simply have surface rust to contend with. 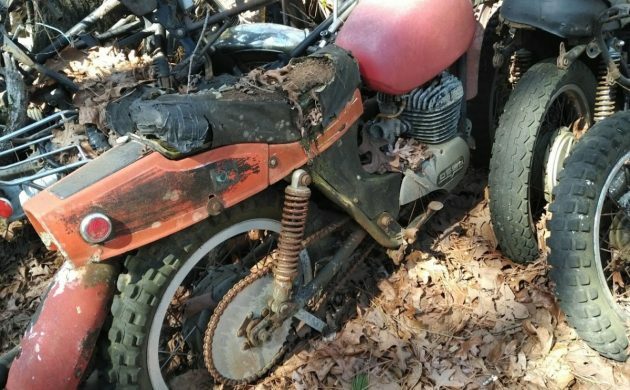 This Honda Dream motorcycle is in nice shape overall, with just some light patina to note as a potential cosmetic “flaw.” These vintage Hondas are coming back strong in terms of interest, along with the cool period enduro bike parked alongside of it. Mechanical Condition: It ranges, but assume most to be projects. In all honesty, with the exception of some of the bikes mentioned here, these are parts bikes for other projects. 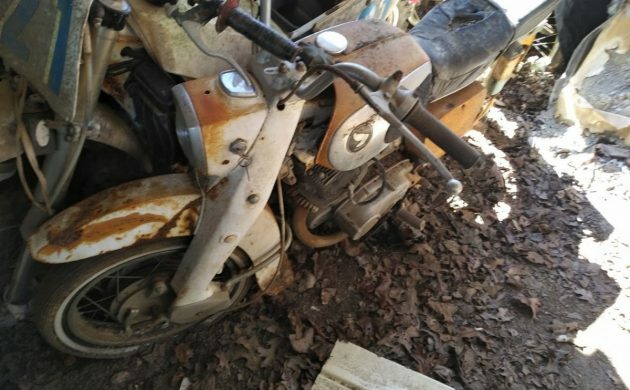 This is a fairly rare Ossa Pioneer 250 (I believe) but it’s been sidelined for a while, and the up-close pictures below reveal a hole in the engine case. Still, given the relative obscurity of the bike and its loyal fan base, there could be good parts here for a more worthy project. Among some of the more interesting engines on the property are a pair of Royal Enfield motors. 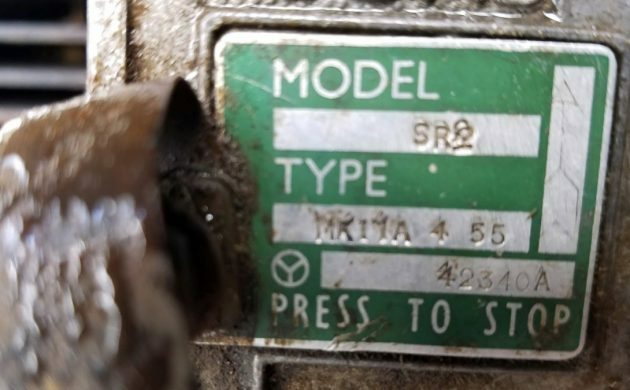 I’ve been digging into this to confirm engine numbers and codes, and I’ve so far gotten fairly strong confirmation that these are from the Lucas SR Magnito engine family, which were used on vintage Royal Enfield motorcycles. I’m sure there’s someone performing a restoration on one of these bikes right now that could use some period-correct motors for their build – reach me via the contact form below if you do. 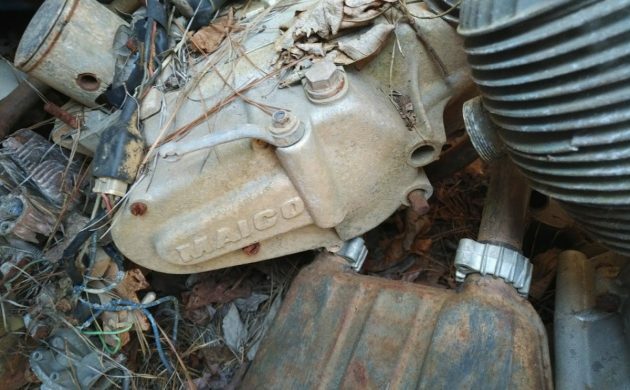 Another set of interesting engine parts include this vintage Maico engine, which we’re working to confirm any identifying numbers on the engine housing itself. I know *very* little about these, other than the individual components seem to bring fairly strong money on eBay – so there’s likely an audience out there somewhere. Take a look at the gallery photos below, which includes another set of Triumph engines, a Triumph frame, a Rickman frame, several Honda and Kawasaki motorcycles, and more. Feel free to help identify any of the mystery finds and please email me if you’re interested in any of the bikes or parts featured here. Do you have a low mileage survivor parked in your garage, shed or barn? Does it need a new home? Please consider listing it here on Barn Finds! Lots of good old stuff there. Wish i was near by so i could take a look. Maico built splendidly lairy big 2-stroke crossers. The Honda’s a C72 or 77, I think – depending on engine size – but looks bigger than the 92 (which is a 125). CB models had less of the square thing going on, and had telescopic forks and bigger brakes. More photos of other things and fewer arty shots of fousty Triumphs, please! The Steve McQueen thing’s mostly that still photo from The Great Escape set of him sitting on a Triumph. He also competed in – I think – the ISDE, maybe also on a Triumph. He was good pals with Bud Ekins, too. Steve was in On Any Sunday too. Great motorcycle man . Found more photos that my first view didn’t show me! Lots of off-road stuff. Yamaha TYs – the yellow/white one’s early, I think – and a DT Yamaha, amongst others. The wide (pill/capsule shaped) speedo in one of the pictures (top left) – that’s not a CB450, is it? They’re a nice thing. The wee gold Honda could be a 175, 250 or 350. Lovely wee things to ride, and easy to work on. Pure hunners ae monkey bikes! That Triumph is sporting a front disc brake… long past the Steve McQueen moviebike era. Aye, I know, but there was mention of a connection in the article and I was wondering whether that image was it in most folks’ minds. I agree, some fun stuff, except, having them outside makes them more of a project. 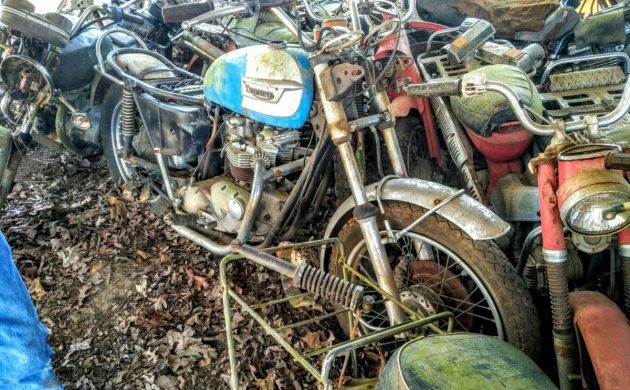 By looking at this, it’s amazing how many motorcycles were bought and ridden, and then, nobody wanted them, and they end up in piles like this. 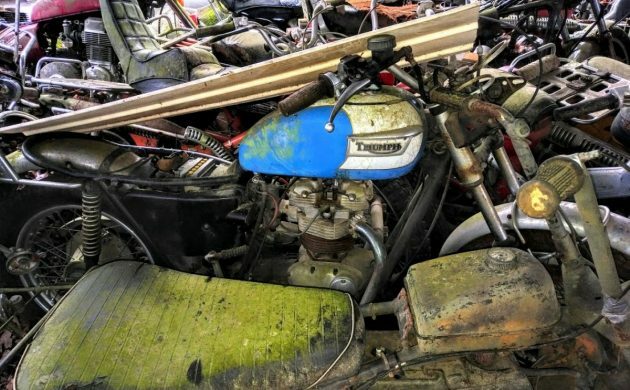 I think the oddball dirt bikes ( Rickman, Maico) will be worth having, because they are so rare, the Suzuki GT380,( probably stuck, time sitting is not kind to 2 strokes) Suzuki was one of the last to run 2 cycle street bikes, and the Triumphs, always neat, no matter what condition. Parts, like CDI boxes and seals, engine parts, could be a hassle. I’d say the Triumph is the best of the lot. Howard, believe it or not, the seller stood on the GT380 and that sucker wanted to spin over right then and there. Could not believe it. the step-thru Honda is probably a CT110 with the dual range “transfer case” type gearbox where the rider could select low or high range. The square Honda Dream may tell you on the tank badge (if it’s still legible) as to whether it’s a 250 (CL72) or the 305 (CL77). The Triumph engine serial number photo is of a post 1969 Bonneville 650. The gold tank Honda looks like a 1972 CB350, with a Honda XR200 behind it and another XR of some kind behind that one (late ‘70’s maybe). The nicely kept red Honda (garage or shop) looks like a 550 or 750F? Between the trucks and the bikes on this find, you seem to have found some great rusty gold, Jeff! Like gold ore though, sometimes the biggest expense is getting it out of the ground and clear of impurities..however, unlike gold, it’s ok just to have it where it can be appreciated by folks right where it’s at. In the lead photo, the red Honda behind the Triumph, looks like a Honda 750 automatic, one of the very few automatic motorcycles made, for some odd reason. And in between are what appear to be a number of H-D’s!!! The automatic was before it’s time, Howard A.-a number of motorcycle manufacturers are now giving the rider the option on some bikes of having a DCT so as to appeal to those who don’t know how to shift, or are unable to manipulate a clutch pull I suppose. Honda also made automatic Dreams – the podgy pre-Superdream ones. Moto Guzzi made one – called the Convert, I think – but I’ve never seen one. The CL’s the scrambler model, isn’t it? A pal of mine has the square 250 (blue with a red seat; how 1960s…) and describes it as a C72. Wrong ID on the Triumph-it IS most likely a TR6 (oil in the frame! )..my bad. where are you guys seeing a RH shift triumph??? Ive been thru the pix multiple times and see none. Shifter on the Blue Triumph is on the right as God & Edward Turner intended, plain as day. Its a 73 TR7. Ive got one as well. Unless someone mixed and matched parts,, its a 73. Anyone wanna put some money on a friendly wager? Jeff told me there is a title, so the VIN will tell the tale. $20 is on the table,,, any takers??? Anyone knows what is the bike 2? The difficult part with vintage bikes is the exhaust pipes. If they need to be replaced, depending on the bike, they can be very hard to find let alone to remake a set. Just put aftermarket exhaust pipes on the bike. Yes, although the English and European bikes have grown a “cottage industry” for the manufacturing of replica parts for most, and some of the Japanese bikes are going down that road now too. Guys, thanks for all of the great intel on identifying some of these bikes – makes my life much, much easier. I’ll keep sorting all of this out and hopefully have more conclusive info soon. Sunk in the dirt is a bad sign. Okay, Rickman first,, Got a couple myself, ADVrider.com has 68 pages of Rickman tech, discussion and Pix,They made roadbikes, roadracers and dirt. Steel tank on yours is a good sign but Im guessing its a dirt bike. (AWESOME bikes, Reynolds 531 Uk version of Chrome Moly super light & strong) Lowest value is the Zundapp version, value $$ Goes up from there. The best ones had British motors, but they had spanish, asian and a few for HD sportster engines. (mine are BSA & Triumph versions) Fiberglass tanks is a topic in itself. As for value, Post 70 OIF models dont tend to be as valuable as pre 71. But street trackers and Desert sled styled bikes as well as Cafe racers are very popular and OIF bikes are excellent donors. Especially short rod 750s. Ill include a pix of Slidin’ Sonny Angel, who builds street trackers out of them. But cafe style is cool too. Google images is chock full of awesome examples. Maico-Breako? Bultaco? CZ? Those European dirt bikes are highly sought after now,, traditionally dirt bike guys and racers are cheap SOBs but highly collectable and worth $$$$$$$. I know a lot of guys who ride vintage race. AHRMA mostly but here in the PNW we have some non AHRMA races and groups. So the challenge in selling that stuff is many still think they are all $300 bikes and they are not. But you gotta wade thru those guys. Ridiculously helpful. Thanks so much! any 1972/73 Suzuki F50 parts?